This article is about the Buddha. For other uses, see Amitabha (disambiguation). Amitābha statue in gold leaf with inlaid crystal eyes. Tokyo National Museum, Tokyo, Japan. Amitābha (Sanskrit pronunciation: [əmiˈt̪aːbʱə]), also Amida or Amitāyus, is a celestial buddha described in the scriptures of Mahāyāna Buddhism. 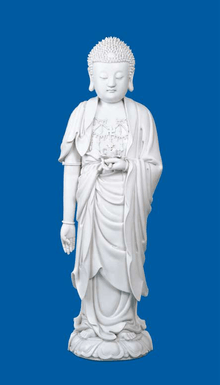 Amitābha is the principal buddha in Pure Land Buddhism, a branch of East Asian Buddhism. In Vajrayana Buddhism, Amitābha is known for his longevity attribute, magnetising red fire element, the aggregate of discernment, pure perception and the deep awareness of emptiness of phenomena. According to these scriptures, Amitābha possesses infinite merits resulting from good deeds over countless past lives as a bodhisattva named Dharmakāra. Amitābha means "Infinite Light" so Amitābha is also called "The Buddha of Immeasurable Life and Light". According to the Larger Sūtra of Immeasurable Life, Amitābha was, in very ancient times and possibly in another system of worlds, a monk named Dharmakāra. In some versions of the sūtra, Dharmakāra is described as a former king who, having come into contact with Buddhist teachings through the buddha Lokeśvararāja, renounced his throne. He then resolved to become a buddha and so to come into possession of a buddhakṣetra ("buddha-field", a realm existing in the primordial universe outside of ordinary reality, produced by a buddha's merit) possessed of many perfections. These resolutions were expressed in his forty-eight vows, which set out the type of buddha-field Dharmakāra aspired to create, the conditions under which beings might be born into that world, and what kind of beings they would be when reborn there. In the versions of the sutra widely known in China, Vietnam, Korea and Japan, Dharmakāra's eighteenth vow was that any being in any universe desiring to be born into Amitābha's pure land (Chinese: 净土; pinyin: jìngtŭ; Japanese pronunciation: jōdo; Korean: 정토; romaja: jeongto; Vietnamese: tịnh độ) and calling upon his name even as few as ten times will be guaranteed rebirth there. His nineteenth vow promises that he, together with his bodhisattvas and other blessed Buddhists, will appear before those who call upon him at the moment of death. This openness and acceptance of all kinds of people has made belief in pure lands one of the major influences in Mahāyāna Buddhism. 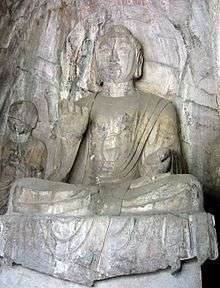 Pure Land Buddhism seems to have first become popular in Gandhara, from where it spread to Central Asia and China. The sutra goes on to explain that Amitābha, after accumulating great merit over countless lives, finally achieved buddhahood and is still residing in his land of Sukhāvatī, whose many virtues and joys are described. Through his efforts, Amitābha created a pure land called Sukhāvatī (Sanskrit: "possessing happiness") . Sukhāvatī is situated in the uttermost west, beyond the bounds of our own world. By the power of his vows, Amitābha has made it possible for all who call upon him to be reborn into this land, there to undergo instruction by him in the dharma and ultimately become bodhisattvas and buddhas in their turn (the ultimate goal of Mahāyāna Buddhism). From there, these same bodhisattvas and buddhas return to our world to help yet more people. Amitābha is also known in Tibet, Mongolia, and other regions where Tibetan Buddhism is practiced. In the Highest Yogatantra of Tibetan Buddhism, Amitābha is considered one of the Five Dhyāni Buddhas (together with Akṣobhya, Amoghasiddhi, Ratnasambhava, and Vairocana), who is associated with the western direction and the skandha of saṃjñā, the aggregate of distinguishing (recognition) and the deep awareness of individualities. His consort is Pāṇḍaravāsinī. His two main disciples (the same number as Gautama Buddha) are the bodhisattvas Vajrapani and Avalokiteśvara, the former to his left and the latter to his right. 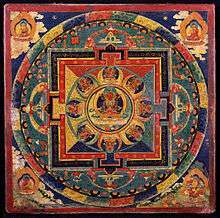 In Tibetan Buddhism, there exist a number of famous prayers for taking rebirth in Sukhāvatī (Dewachen). One of these was written by Je Tsongkhapa on the request of Manjushri; for a discussion and translation of the most important prayers in the Tibetan tradition see Halkias. 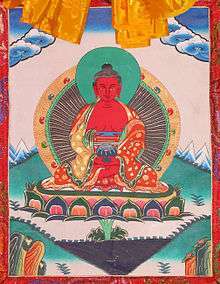 The Panchen Lamas and Shamarpas are considered to be emanations of Amitābha. He is frequently invoked in Tibet either as Amitābha – especially in the phowa practices or as Amitāyus – especially in practices relating to longevity and preventing an untimely death. In Shingon Buddhism, Amitābha is seen as one of the thirteen Buddhas to whom practitioners can pay homage. Shingon, like Tibetan Buddhism, also uses special devotional mantras for Amitābha, though the mantras used differ. Amitābha is also one of the Buddhas featured in the Womb Realm Mandala used in Shingon practices, and sits to the west, which is where the Pure Land of Amitābha is said to dwell. Amitābha is the center of a number of mantras in Vajrayana practices. The Sanskrit form of the mantra of Amitābha is ॐ अमिताभ ह्रीः (Devanagari: oṃ amitābha hrīḥ), which is pronounced in its Tibetan version as Om ami dewa hri (Sanskrit: oṃ amideva hrīḥ). His mantra in Shingon Buddhism is On amirita teizei kara un which represents the underlying Indic form oṃ amṛta-teje hara hūṃ. In addition to using the mantras listed above, many Buddhist schools invoke Amitābha's name in a practice known as nianfo 念佛 in Chinese and nembutsu in Japanese. The proper form of Amitābha's name in Sanskrit is Amitābha, masculine, and the nominative singular is Amitābhaḥ. This is a compound of the Sanskrit words amita ("without bound, infinite") and ābhā ("light, splendor"). Consequently, the name is to be interpreted as "he who possesses light without bound, he whose splendor is infinite". The name Amitāyus (nominative form Amitāyuḥ) is also used for the Sambhogakāya aspect of Amitabha, particularly associated with longevity. He is mostly depicted sitting and holding in his hands a vessel containing the nectar of immortality. In Tibetan Buddhism, Amitayus is also one of the three deities of long life (Amitayus, White Tara and Uṣṇīṣavijayā) . Amitāyus being a compound of amita ("infinite") and āyus ("life"), and so means "he whose life is boundless". In Chinese, 阿弥陀佛 ("Āmítuófó"), sometimes pronounced "Ēmítuófó", is the Chinese pronunciation for the Sanskrit name of the Amitābha Buddha (Amida Buddha). The "a mi tuo" is the transliteration of the Sanskrit word "Amida" which means "boundless" (无量, "wuliang"). "Fo" is the Chinese word for "Buddha". The name Amitābha is given in Chinese as Wúliàngguāng (無量光; "Infinite Light"), while the name Amitāyus is given as Wúliàngshòu (無量壽; "Infinite Life"). These names are not, however, very commonly used. In Japanese, he is also called Amida Nyōrai (阿弥陀如来, "the Tathāgata Amitābha") . In Tibetan, Amitābha is called འོད་དཔག་མེད་ Wylie: 'od dpag med, THL: Öpakmé and in its reflex form as Amitāyus, ཚེ་དཔག་མེད་ Wylie: tshe dpag med, THL: Tsépakmé . They are iconographically distinct. Amitābha is said to display 84,000 auspicious and distinguishing marks reflecting his many virtues. 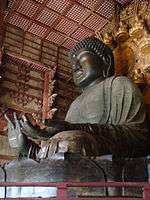 Amitābha can often be distinguished by his mudrā: Amitābha is often depicted, when shown seated, displaying the meditation mudrā (thumbs touching and fingers together as in the Great Buddha of Kamakura (鎌倉大仏) at Kōtoku-in or the exposition mudrā, while the earth-touching mudrā (right hand pointed downward over the right leg, palm inward) is reserved for a seated Gautama Buddha alone. He can also be seen holding a lotus in his hands while displaying the meditation mudrā. There is a difference between Amitāyus and Amitābha. Amitāyus—the Buddha of Infinite Life—and Amitābha—the Buddha of Infinite Light—are essentially identical, being reflective images of one another. Sutras in which Gautama Buddha expounds the glories of Sukhavati, the Pure Lands, speak of the presiding Buddha sometimes as Amitabha and sometimes as Amitayus. When depicted as Amitāyus he is depicted in fine clothes and jewels and as Amitābha in simple monk's clothing. They are also simply known as Amida in the Chinese and Japanese tradition. The image of the gold colored statue in the article is of Amitayus as he is wearing a five-pointed crown, which is the easiest way to distinguish them. Amitāyus is an emanation of Amitābha. Amitābha is the head of the Lotus family. When standing, Amitābha is often shown with left arm bare and extended downward with thumb and forefinger touching, with the right hand facing outward also with thumb and forefinger touching. The meaning of this mudra is that wisdom (symbolized by the raised hand) is accessible to even the lowest beings, while the outstretched hand shows that Amitabha's compassion is directed at the lowest beings, who cannot save themselves. When not depicted alone, Amitābha is often portrayed with two assistants: Avalokiteśvara on the right and Mahāsthāmaprāpta on the left. In Vajrayana, Amitābha is the most ancient of among the Dhyani Buddhas. He is of red color originating from the red seed syllable hrīḥ. He represents the cosmic element of "Sanjana" (name). His vehicle is the peacock. He exhibits Samadhi Mudra his two palms folded face up, one on top of the other, lying on his lap. The lotus is his sign. When represented on the stupa, he always faces toward west. He is worshiped thinking that one can have salvation. The first known epigraphic evidence for Amitābha is the bottom part of a statue found in Govindnagar, Pakistan and now located at Government Museum, Mathura. The statue is dated to "the 28th year of the reign of Huviṣka" i.e., sometime in the latter half of the second century during the Kushan Empire, and was apparently dedicated to "Amitābha Buddha" by a family of merchants. The first known sutra mentioning Amitābha is the translation into Chinese of the Pratyutpanna Samādhi Sūtra by the Kushan monk Lokakṣema around 180. This work is said to be at the origin of pure land practices in China. The appearance of such literature and sculptural remains at the end of the second century suggests that the doctrine of Amitābha probably developed during the first and second centuries. Furthermore, there are sculptures of Amitabha in dhyani mudras as well as bronzes of Amitabha in abhaya mudra from the Gandhara era of the first century, suggesting the popularity of Amitabha during that time. One of the last prayer busts of Amitabha can be found in the trademark black stone of the Pala Empire, which was the last Buddhist empire of India and lost its influence in the twelfth century due to muslim conquests on the Indian subcontinent. ↑ "The Great Compassion Mantra - Namo Amitabha". Archived from the original on 2009-10-25. ↑ "Bardo: Fourth Day". Kaykeys.net. 2005-02-07. Retrieved 2012-11-07. ↑ "Symbolism of the five Dhyani Buddhas". Archived from the original on March 8, 2009. ↑ "Pandara is said to be the Prajna of Amitabha Buddha. Pandara is the same in essence with Buddha Amitabha". Himalayanmart.com. Retrieved 2012-11-07. 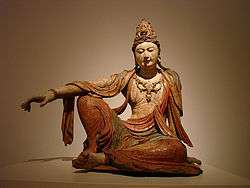 ↑ "Guan Yin - Bodhisattva/ Goddess of Compassion". Nationsonline.org. 2011-06-04. Retrieved 2012-11-07. ↑ Tibet is My Country: Autobiography of Thubten Jigme Norbu, Brother of the Dalai Lama as told to Heinrich Harrer, p. 121. First published in German in 1960. English translation by Edward Fitzgerald, published 1960. Reprint, with updated new chapter, (1986): Wisdom Publications, London. ISBN 0-86171-045-2. ↑ "Teachers: Shamar Rinpoche". Archived from the original on 30 October 2007. Retrieved 2007-10-21. ↑ "Amitayus". 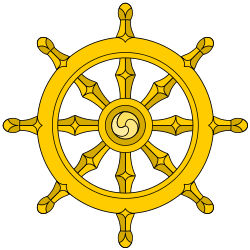 Rigpa Wiki. Retrieved 2012-11-07. ↑ "Buddhist Charms". Retrieved 22 May 2014. ↑ Olson, Carl (2005). The Different Paths of Buddhism: A Narrative-Historical Introduction. New Brunswick, NJ: Rutgers University Press. p. 185. ISBN 0813535611. Retrieved 9 June 2016. ↑ Landaw, Jonathan. Images of Enlightenment: Tibetan Art in Practice. Snow Lion Publications. pp. 75, 80, 96. ISBN 978-1-55939-832-9. ↑ "On the origins of Mahayana Buddhism" (PDF). Archived from the original (PDF) on 2013-06-12. Retrieved 2013-06-14. Wikimedia Commons has media related to Amitābha.